The CX-5 is a funky-looking, mid-sized SUV that’s priced and specified to rival the Volkswagen Tiguan. Trouble is, so are countless other alternatives; so, does the Mazda have the wherewithal to set it apart from the madding crowd? There’s an awful lot to like about the CX-5. Its fresh, modern styling, spacious, versatile interior, slick driving manners and excellent build quality combine to make it feel and drive like a solid, dependable family-friendly SUV. We’d strongly advise against the weedy petrol engine, and think it’s worth finding the significant chunk of extra cash to buy the most powerful diesel-engined version. As well as giving the CX-5 the performance it deserves, this engine makes for a more relaxing drive in everyday circumstances and is infinitely more refined than the other engines. Smooth and powerful with loads of kit, but it’s pricey. Excellent economy, but it could do with a bit more oomph. Engine lacks flexibility and feels seriously underpowered. 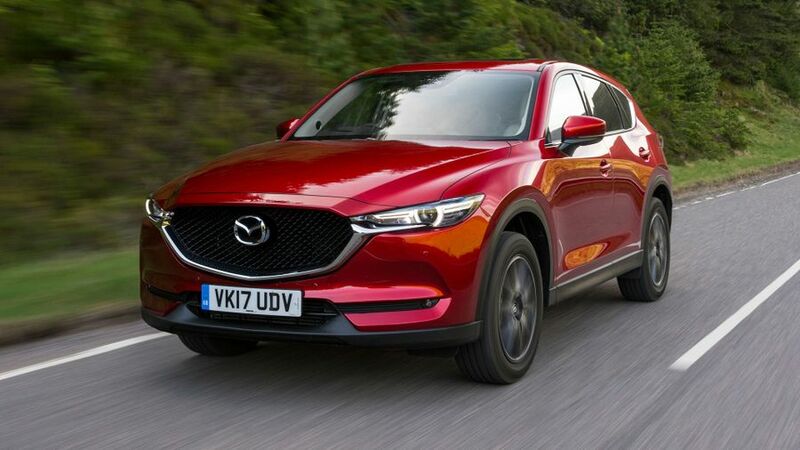 Stand in front of the shark-like snout of the CX-5 and there's no doubt about the impact it'll make, blending razor-sharp edges with a raised Mazda logo the size of a dartboard sitting smack in the middle of a gaping grille. Refreshingly, the CX-5 is available in just two trims and, while both come with sparkling LED running lights and foglights, as well as tinted rear side windows, the Sport Nav cars do look that bit more ‘street’ thanks to their larger 19-inch alloy wheels. 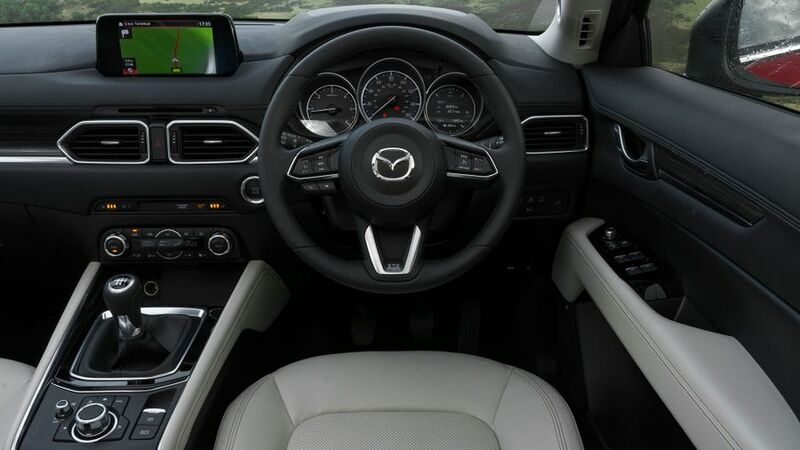 Given the massive growth in SUV sales, along with the vast improvements in interior design and myriad technical upgrades that these vehicles have gained in recent times, it's no surprise that Mazda has gone to considerable lengths to upgrade to the CX-5’s interior. That said, although it is a significant upgrade, the revamped cabin is no better than what you have a right to expect at this price, and it doesn’t look or feel quite as premium as the Volkswagen Tiguan's. Positives include an excellent range of adjustment for both the driver’s seat and steering wheel, and everything you touch – such as the leather-wrapped steering wheel and gearlever – are of nice quality. Likewise, the panels are solidly screwed together, and the rotary control that let’s you scroll through the infotainment menus is handily located and good to use. Notably, the infotainment screen now sits on top of the dashboard, but although it looks more like an afterthought, it’s much quicker to react and easier to focus on than the one in the previous CX-5, which was integrated into the dashboard. Upgrade to Sport Nav trim and you also get a head-up display that appears in the windscreen. It's very easy on the eye and the instructions are easy to follow when used in conjunction with the sat-nav. 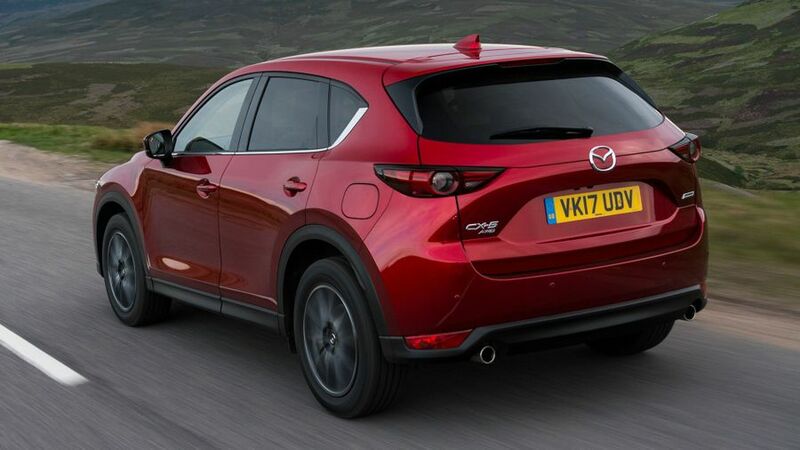 The CX-5 may be priced and specified to go head-to-head with the Volkswagen Tiguan, but the Mazda is a bigger vehicle, especially where it counts. Being slightly wider and a good bit longer means it provides more elbow room and a lot more legroom for rear-seat passengers. Granted, the rear seats can't slide back- and forwards in the same way they do in the Tiguan, but at least the Mazda’s backrest can be reclined by a few degrees to help your passengers catch forty winks. The CX-5 also has a properly big boot, with a 506-litre capacity that expands to 1,620 litres when you fold down the 40/20/40-split rear seat backs. These can be flipped down in a trice by using handles just inside the boot and they lie almost flat once they are down, so it’s a relatively easy task to load longer items. Make the jump to Sport Nav trim and you also get a powered tailgate that can be controlled remotely via the key fob. The CX-5 is one of the more agile SUVs, and always manages to remain composed and stable. This can be great fun when the road is open, smooth and twisty, and when you can bundle along at a decent rate of knots. However, it’s not so great when confronting the craggy city-centre surfaces that you typically find on your way into work. That said, even though it errs on the firm side, the suspension is still adept at dealing with the lumps and bumps that attempt to dislodge your fillings, because each crater is rebuffed with a single thud rather than shaking the whole cabin to its foundations. The CX even steers quite sweetly at lower speeds, but some engineer unfortunately seems to have got his calculations back to front: instead of increasing in weight as the car builds speed, to give a reassuring, planted feel on the motorway, the steering gets lighter and starts to feel quite divorced from the front wheels. After countless fastidious weight-saving programmes, aimed at boosting performance and reducing fuel consumption and CO2 emissions, Mazda has finally conceded that this approach does impact on refinement. As a result, the latest CX-5 has 50kg more sound-deadening than the old model. Drive the two cars back to back, and you’ll certainly notice the difference; but, compared to most other cars in this class, the CX-5 is still only average, and worse in some areas. Although most noise is generally well supressed, you can never fully rid yourself of the feeling that a door or window is open. The 2.0-litre petrol engine is one of very few modern engines without a turbocharger to boost its power. And this is a glaringly obvious omission, because unless you’re revving it until it sounds like the pistons are about to explode, it’s flatter than a pitta bread. With a notable lack of low- and mid-range grunt, it’s at its most frustrating when encountering an incline or when asked to summon up some additional overtaking zip. Because it’s so much stronger, especially at low- and mid-range revs, the 2.2-litre 148bhp turbodiesel engine is a far better bet. Don’t go thinking it’s perfect, though. Although it is generally smooth, it’s prone to generating a fair bit of vibration at lower revs; and, although it's reasonably flexible at lower speeds, you still need to give it a good old kick in the pants, and make sure you’ve got plenty of clear road ahead, when attempting to pass an ambling grocery van on a twisting B-road. If you can afford the premium for the stronger, 173bhp version of this engine, then it will be money well spent. Not only does it feel instantly more alert and infinitely more flexible, it’s almost as economical and far more refined than its lower-powered sibling. Despite the debate surrounding diesel-engine emissions and their impact on air quality, for now at least, the lower-powered front-wheel drive diesel car is expected to be the best seller. It averages 56.5mpg and emits 132g/km of CO2, but if you want the added reassurance of four-wheel drive traction, fuel consumption drops to 52.3mpg, while the CO2 emissions rise to 142g/km. Expect a further drop of around 4mpg if you add an automatic gearbox, which, when many autos are just as economical as their manual counterparts these days is difficult to fathom. If fuel economy is a priority, we'd avoid the petrol model. Although it looks pretty good on paper - returning 44.1mpg and emitting 139g/km of CO2 in the official tests - you’ll need to work it very hard to extract any kind of performance, so you’ll be lucky to get anywhere near that figure. One area where the CX-5 excels is resale values. These are high because the car is very sought-after as a used buy, thanks to being sold in relatively small numbers and having a great reputation for reliability, which makes you wonder why Mazda only provides a three-year 60,000-mile warranty. The previous CX-5 scored the maximum five stars in Euro NCAP crash tests, and that's a feat that's been matched by this model. It's no surprise given the generous amount of safety kit on offer. Over and above the six airbags, Hill Hold Assist and the usual electronic skid-prevention aids, all models get Smart City Brake Support as standard. If there is the danger of a collision with a vehicle or pedestrian in front, the system alerts the driver using a warning sound and, if it detects a collision is unavoidable, it automatically applies the brakes to slow or even stop the car. In addition, as part of an optional safety pack, you can specify Rear City Brake Support, which does a similar job, but works in reverse gear at speeds of 1-5mph. This pack also includes Adaptive LED Headlights, which turn off sections of the LEDs, so that the high beams can be used continuously without dazzling other vehicles; and, at speeds over 60mph, visibility is increased by tilting the headlamp upwards. Among the other technologies included are Lane Keep Assist and Blind Spot Monitoring with Rear Cross Traffic Alert. All models feature LED headlights, automatic power-folding door mirrors, dual-zone climate control, DAB radio and the latest 7.0-inch colour touch-screen with integrated sat-nav. Sport Nav cars add a reversing camera, eight-way electrically adjustable driver’s seat and smart keyless entry, plus heated front seats and steering wheel. On top of that, they also feature a powered tailgate, plus a head-up display that projects directly onto the windscreen and features Traffic Sign Recognition. 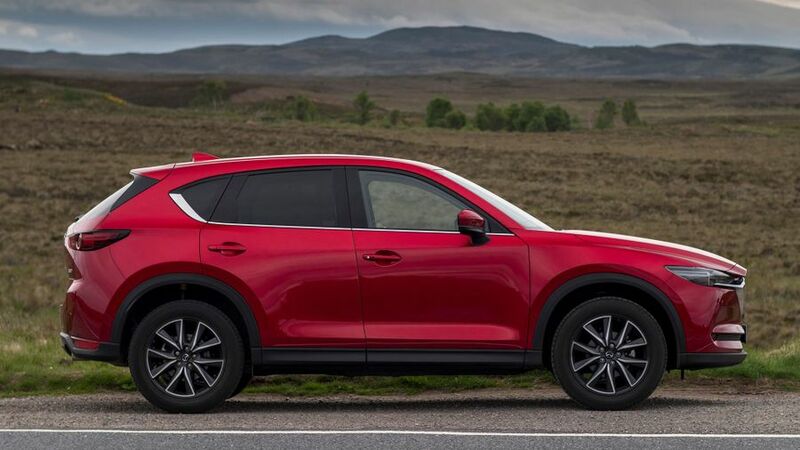 The CX-5 is a handsome, practical, neat-handling SUV that offers plenty of space for all the family; and, if you choose the right engine, it’s also a strong performer that should provide faithful service for many years.